Badlands of Indiana (October 31, 2015) WHR — Queen’s classic “mock opera” was released on October 31, 1975, which means it turns 40 years old today. Though the song was met with skepticism when played for preview audiences, it ended up spending nine weeks at number one on the UK charts in 1976. It currently ranks as the third best-selling UK single of all time (behind Elton John’s Princess Diana tribute “Candle in the Wind” and Band Aid’s holiday-made “Do They Know It’s Christmas?”) and was inducted into the Grammy Hall of Fame in 2004. Here are 10 fun facts about the iconic song to consider the next time you’re hitting those “Galileo” high notes along with your car radio. 2. THE BAND’S PRODUCER WAS SKEPTICAL OF ITS OPERA-LIKE COMPOSITION. Roy Thomas Baker, who produced the band’s A Night at the Opera album, first heard the framework for "Bohemian Rhapsody" when he picked Freddie up at his Holland Road flat in London one evening before going out to dinner. Freddie led him to the piano to play the song he’d been working on. 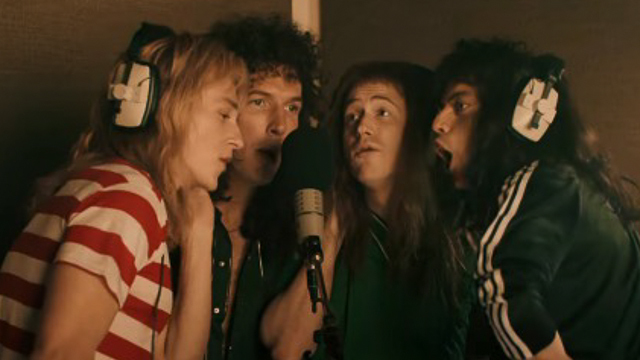 As Baker recalls the scene, Freddie played the opening ballad section of the tune then stopped and exclaimed, “And this is where the opera section comes in!” Baker laughed at the time, but when Freddie came to the studio days later armed with various pieces of paper with notes and doodles outlining his composition, the producer determined to use all his talent and equipment to capture Mercury’s vision on tape. 3. MERCURY WAS ALWAYS ADDING ANOTHER “GALILEO.” In 1975, “state-of-the-art” recording meant 24-track analog tape. The harmonies on the opera section (all sung by Mercury, drummer Roger Taylor, and guitarist Brian May) required 180 separate overdubs, and eventually the tape had been run over the recording heads so many times that it became almost transparent. In the end it took three weeks (Mercury was always adding “another ‘Galileo’,” Baker explained) and five different studios to complete the track. 4. ELTON JOHN THOUGHT THE SONG WAS TOO “WEIRD” FOR THE RADIO. Prior to its release, Queen’s manager played a rough mix of the song to one of his other high-profile clients, Elton John, to get his opinion. “Are you f*cking mad?” was the singer’s reaction after listening to the nearly six-minute song. His verdict: it was too long and too “weird” for radio. 5. THE SONG’S SUCCESS IS DUE IN PART TO A SINGLE DJ. “Bohemian Rhapsody” owes part of its success to British DJ Kenny Everett, who had a popular morning radio show on Capital Radio. In early October 1975, EMI was still pressuring Queen to release “You’re My Best Friend” as the first single from A Night at the Opera. Everett got his hands on an early pressing of “Bohemian Rhapsody,” with strict instructions not to broadcast it (wink, wink). Somehow, strictly by accident (his finger must have slipped), he played the song 14 times over the course of two days. Callers flooded the radio station and local record stores with requests for the song, so the suits at EMI relented and released the magnum opus as a single. 6. PROMOTING THE SONG PROVED PROBLEMATIC. After it was decided to release “Bohemian Rhapsody” as a single, the band was faced with a bit of a dilemma: At the time in England, it was traditional for bands to appear on shows like Top of the Pops to promote their latest hits. But Queen was scheduled to begin a tour soon, plus (as Brian May admitted) they’d feel self-conscious miming to the operatic section. They solved the problem by filming a promotional film, or “pop promo” as it was called in the industry lingo of the time, that could be shown not only on UK music shows, but also around the world in other markets, such as American Bandstand. 7. THE VIDEO TOOK JUST UNDER FOUR HOURS TO FILM. The band arrived at Elstree Studios (using the same stage they were using to rehearse for their upcoming tour) at 7:30 in the morning, and were finished and relaxing at the local pub by 11:30 a.m. The total cost of the video was £4500, or about $2025. This was the first music video directed by Bruce Gowers, and the success of that clip eventually prompted him to move to Hollywood, where he went on to direct such TV programs as the MTV Movie Awards, the Primetime Emmy Awards, the People's Choice Awards and the first 10 seasons of American Idol. 10. A BLUE VINYL PRESSING OF THE SONG IS WORTH MORE THAN $5000. The Holy Grail in terms of Queen collectibles is a 7-inch limited edition of “Bohemian Rhapsody” that was pressed in blue vinyl. In the summer of 1978, EMI Records won the Queen’s Award To Industry For Export Achievement (that’s “Queen” as in Her Majesty Elizabeth II). The label’s primary reason for sales in far-reaching territories that lacked manufacturing facilities was Queen, as in the band. To celebrate their prestigious award, EMI pressed 200 copies of “Bohemian Rhapsody” in blue vinyl, each of which was hand-numbered. Numbers one through four went to the band members, of course, while other low-numbered copies were given to friends and family members. Bona fide copies from this original pressing currently sell for upwards of $5000. In the summer of 1977, members of the rock band Aerosmith inspected an airplane they were considering chartering for their upcoming tour—a Convair 240 operated out of Addison, Texas. Concerns over the flight crew led Aerosmith to look elsewhere—a decision that saved one band but doomed another. The aircraft in question was instead chartered by the band Lynyrd Skynyrd, who were just setting out that autumn on a national tour that promised to be their biggest to date. On this day in 1977, however, during a flight from Greenville, South Carolina, to Baton Rouge, Louisiana, Lynyrd Skynyrd’s tour plane crashed in a heavily wooded area of southeastern Mississippi during a failed emergency landing attempt, killing band-members Ronnie Van Zant, Steve Gaines and Cassie Gaines as well as the band’s assistant road manager and the plane’s pilot and co-pilot. Twenty others survived the crash. The original core of Lynyrd Skynyrd—Ronnie Van Zant, Bob Burns, Gary Rossington, Allen Collins and Larry Junstrom—first came together under the name “My Backyard” back in 1964, as Jacksonville, Florida, teenagers. Under that name and several others, the group developed its chops playing local and regional gigs throughout the 1960s and early 1970s, then finally broke out nationally in 1973 following the adoption of the name “Lynyrd Skynyrd” in honor of a high school gym teacher/nemesis named Leonard Skinner. The newly renamed band scored a major hit with their hard-driving debut album (pronounced ‘lĕh-‘nérd ‘skin-‘nérd) (1973), which featured one of the most familiar and joked-about rock anthems of all time, “Free Bird.” Their follow-up album, Second Helping (1974), included the even bigger hit “Sweet Home Alabama,” and it secured the band’s status as giants of the southern rock subgenre. On October 17, 1977, Lynyrd Skynyrd—now in a lineup that included backup singer Cassie Gaines and her guitarist brother, Steve—released their fifth studio album, Street Survivors, which would eventually be certified double-platinum. Three days later, however, tragedy struck the group when their chartered Convair 240 began to run out of fuel at 6,000 feet en route to Baton Rouge. The plane’s crew, whom the National Transportation Safety Board would hold responsible for the mishap in the accident report issued eight months later, radioed Houston air-traffic control as the plane lost altitude, asking for directions to the nearest airfield. “We’re low on fuel and we’re just about out of it,” the pilot told Houston Center at approximately 6:42 pm. “We want vectors to McComb [airfield] poste-haste please, sir.” Approximately 13 minutes later, however, the plane crashed just outside of Gillsburg, Mississippi.